Our 7th annual Bootcamps are right around the corner (7 years, how did that happen?! ), and we are knee deep in planning a meaningful, purposeful, and joyful summer experience for all of you! We know OWL Bootcamp in an investment. Not only financially, but in time! 6 days away from your family, friends, and vacation mode! But trust us, it’s worth it. You’ll feel energized and on track for your best school year ever. 1) What will I get from the bootcamp? Is this enough to implement the approach next year? How different is it from a workshop? Bootcamp is week long experience to get you going 100% day one of your new school year. Along with 5 days of OWL method training, we also partner with ACTFL to give you the OPI Familiarization Training. You will feel confident in your abilities to use this approach as well as resources to keep you going throughout the year. 1.b Is the OWL approach all or nothing when you have to teach a specific curriculum from your school? or is it OK to use it just a few times a week? (in my current job I have to give students a test with very specific content that requires the use of grammar and vocabulary from the book. OWL does not have to be an all or nothing approach. You can implement as little or as much as you want. We strive for 100% target language, student-driven curriculum, and we also know that schools have adopted curriculums and test books that must be used. Using OWL as much as you can opens up not only your students, but also a dialogue between you and your colleagues. 2) Who should attend the camp, those who already have some training and want to consolidate or those with little or no experience/knowledge of it? (I belong to the second group and I don’t want to realize there that I needed to be more involved to get the benefits of the camp. Each Bootcamp differentiates strands based on participant experience. 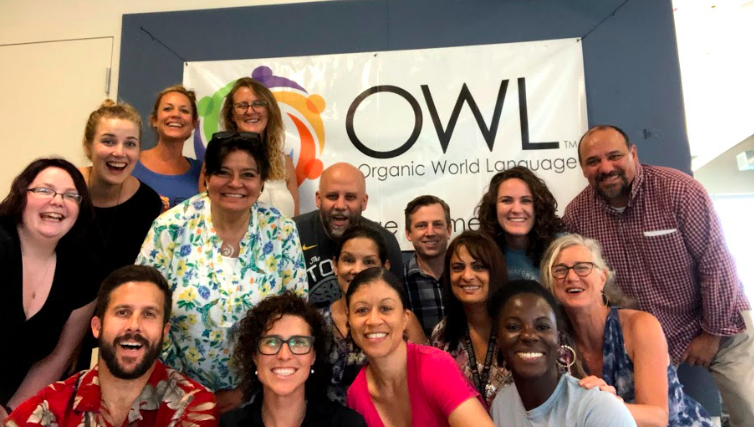 In general, there is a group of brand new to OWL teachers, a group that has been to a workshop or two and are still working their way through implementation, and a group which is fully implementing and looking for artistry in their classrooms. You do not have to be married to one group all week. It is your experience and your time to learn! 3) If I attend the camp this year, I will have to pay for it myself. A second option is to wait for a year to attend the camp, I am asking if there are options to pay less or to pay with smaller monthly payments. Yes! If you’ve attended workshops in the past, there’s a discount. If you’ve attended Bootcamp in the past, there’s a discount. If you’re coming with a group larger than 5, there’s a discount! We also do payment plans to help teachers out. You can contact Linda at admin@organicworldlanguage.com or 541-622-2103. She’d be more than happy to set you up with what you can do! Got a question? We want to answer! Contact us, we want you a part of our best summer yet!